News of Carl Sagan's involvement with a plan to "nuke" the moon, Project A119, has become relevant again. In fact, Sagan was involved in a number of military causes during his all-too-short lifetime. But later, he cut all ties with the military. Here's what happened. 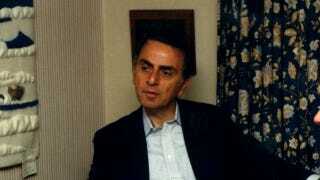 Carl Sagan spent his childhood under the ominous cloud of World War II. As the war faded and the United States and USSR entered a Cold War, the United States once again looked to its best and brightest — including many academic scientists — to consult with the military. Sagan's extremely limited involvement in a theoretical plan to "Nuke the Moon" as a show of U.S. military might recently caused an uproar, but this was just one aspect of Sagan's involvement with the militarily. Sagan's involvement in Project A-119 occurred while he worked toward his Ph.D. at the University of Chicago. The good scientist actually broke personnel restrictions placed on the classified project by listing his involvement on a job application. The majority of Sagan's contact with the military came as a member of the Air Force Scientific Advisory Board beginning in 1966. Sagan lectured at Harvard at this time in his life, but would soon depart to become Associate Professor of Astronomy in the Center for Radiophysics and Space Research at Cornell after being denied tenure by Harvard. At this time in his career, Sagan had already begun to publish his suppositions about the atmosphere of Venus and became a member of the fringe in the eyes of many thanks to his ruminations on the possibility of intelligent life in the universe. Sagan also played a role in advising the U.S. Space Program, a program synonymous with military applications during the Cold War era. Sagan allegedly received $800 per day (roughly $4500 in current dollars), an astounding sum for a university lecturer, to act as a consultant for the Air Force Scientific Advisory Board. The United States Air Force Scientific Advisory Board began in 1944 as a secret program with a variety of missions, including determining the possibility of using atomic energy in jet propulsion as well as non-traditional use of nuclear weapons. Sagan's military contact revolved around Project Blue Book, a 23-year study of UFOs conducted by the United States Air Force that ceased in January of 1970. Project Blue Book took a systematic approach to the study of unidentified flying objects, analyzing possible UFO data and aiming to determine if these objects were a danger to United States national security. Within the two-decade-plus report are 12,618 "sightings", with analysis leaving a mere 700 classified as unidentified. The Air Force Scientific Advisory Board, however concluded that Project Blue Book did not meet necessary rigors, suggesting a university-led study of unidentified flying objects would be far more conclusive. After the closure of Project Blue Book, Sagan continued to act as a prominent scientific advisor for NASA, arguing for the financial merit of robotic spacecraft. Sagan became an extremely vocal advocate against nuclear proliferation after the rise of President Reagan's Strategic Defense Initiative. Sagan openly protested the testing of nuclear weapons, with the sage arrested for trespassing after a 1986 underground detonation of a thermonuclear warhead in the Nevada desert. Though he cut ties with the military, Sagan continued to ponder the idea of space war. He concocted the Deflection Dilemma — the idea that the using a significant blast to knock a near earth object on a trajectory towards earth off course could also be used as a weapon, sending the object into the country or countries of choice. If you are curious, you can lose an entire weekend and browse through the entirety of Project Blue Book online thanks to the Project Blue Book Archive, or have a marathon of Twin Peaks to catch a hint of the intrigue surrounded Project Blue Book. Top image courtesy of the CDC and is within public domain. Black and white UFO image is circa 1952 and courtesy of the CIA/PD.